I completely forgot to post the last Journal Friday here, so I’m catching up now. I’ve already posted the video to social media, but I wanted to post it here as well. This spread really came out of nowhere, and I wasn’t of any of it when I started, except that I new that I wanted to start with collage. As I started the spread, I got a phone call from my brother saying that one of our uncles had passed away. It wasn’t unexpected. He had suffered a stroke a few months ago, and had been in the hospital ever since. He hadn’t really recovered, and I wasn’t surprised with the call. But still it was sad, and my heart hung heavy as I worked on the spread. The news did help dictate the direction of the page, and it became a way to process the feelings and emotions. I did a variation on blackout poetry once I glued the book pages in, and I searched out rather heavy words as I began to string together phrases. But as I looked outside at the leaves beginning to bud on the bushes and trees, I knew I had to incorporate inspirations of spring despite the sad the news. As I worked through the page, I allowed my thoughts to churn and turn. Though the final spread seems to bear little to no semblance to the sad news, it was a great help in allowing me to process my feelings. Welcome to the twelfth and final lesson of the Creative Prayer Book. 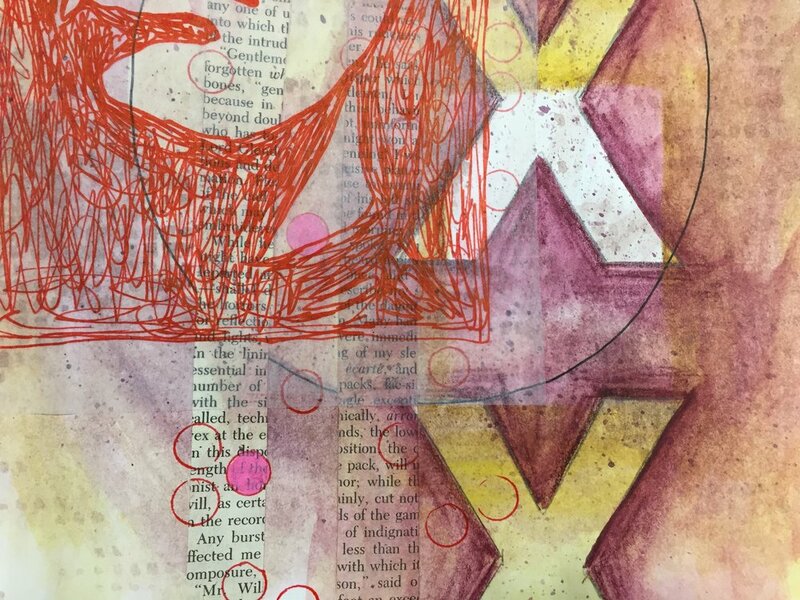 In this lesson, I try to wrap up my pages with some simple embellishments. Though I talked of embellishing text last week, this lesson is about adding a bit more to the pages in general, as a way to tie things together on a page, to fill in some empty areas, and to bring some emphasis to certain areas. You can use any materials to embellish, but I like to use drawing materials like pens, paint markers, and colored pencils. There are also a large number of ways to embellish, but I’m keeping it rather simple as I bring a bit of polish to my pages. One of the simplest ways to add embellishments is to add lines, shapes, and patterns. These little touches can help fill in empty areas and add a final layer to pages. By grouping them closely together around elements you can bring a bit of emphasis and make the elements “pop”. I like to use my uni-ball Vision pens for much of this, but paint markers work great, as well, especially when drawing over glossy surfaces like magazines. I like to use stripes, spirals, rectangles, and circles as I embellish, and I can even use stencils and tracers to add the embellishments. Colored pencil is perfect for adding a bit of depth to my pages as I use them to shade and color in areas. I use the colored pencils very much like I did the Inktense and watercolor pencils earlier on in the workshop and shade around elements. By applying a darker value around a shape or a letter, the shape or letter “pops” out from the page since the colored pencil acts like a shadow. I try to lighten up on my pressure so that the color fades into the background. I can be very neat and careful with this technique, or I can be a bit messy and give my page a bit of a rougher feel. I also use the colored pencil to shade or color in areas and letters, and I like to use white colored pencil sometimes. The white doesn’t cover everything within the space, but it lightens it. This can bring a bit of contrast to the space making it stand out. Shading is always a great way to add some final embellishment to a page. As you work, try to think of various ways to decorate and embellish your pages. Try some of these ideas, and perhaps, try combining them. Or think of your own ways to wrap up your pages, and use any material that you like. Just remember that you’re just trying to add a bit of pizzazz to your pages on not completely reworking them. I hope that you enjoyed these lessons, and I’ll be back next week to wrap up things. I’ll share a flip through my pages, and talk about the project, as well as share about what’s to come. Thank you so much, and happy creating! Welcome to the tenth lesson of the Creative Prayer Book. We’ve focused on stenciling letters and words, using our own handwriting, and using found text, so this quick lesson is about drawing text. You might think about those block and bubble letters that you used when you were in school, and they’re perfect for this. But don’t limit yourself to just these two ideas. You can also use drawn script, fancy fonts, and graffiti letters and words. So, experiment with a variety. If you’re not comfortable with drawing letters and words, use a pencil first, and perhaps practice on a piece of scrap paper first. If you’re a complete novice, one technique uses your own printed letters as a skeleton for the larger, drawn letter. Using a pencil, lightly write your word or words. Then, draw in the letters around the thin lines. You can make thin and thick letters this way. Erase your original, guide letter. Of course, you can simply draw in the letters as you go, but be careful and pay attention to spelling. That’s why I like having the words and phrases drawn on a separate paper so that I can make sure that I am spelling things correctly. As you draw your letters, think about the outer shape of the letter, and if needed, use a pencil to lightly sketch in the lines. I like to draw my letters with a pen, and I don’t worry about using a pencils. But I’m pretty confident with drawing words, but I still make spelling and placement mistakes. Give drawing letters words and phrases a go! I plan on just two more lessons in this series, and we’re done with the text and words, so if you still have space, feel free to stencil, write, draw, or find your text to fill in the spaces. Thank you for joining me again, and as always, Happy Creating!